Route description: the coastal path is not operative. We can follow the white and red markings of the GR-92 which go inland and we come to cala Pedrosa. Points of interest: Romaboira fall, Roca del Cavall, Pedrosa cove. Having left the watchtower and come to Sant Baldiri, we will follow the GR-92 markings northbound for the spectacle of the vertical coast with the lead and cinnamon tones of the rocks. The Romaboira fall is especially impressive; a cliff that drops straight into the sea and catches our attention for its height (187 m). We will follow the markings of the GR-92 inland. This section is recommended for walkers used to the mountains. If you do the past, take special care in the first section as it goes close to cliffs that are not protected. We continue inland along the GR-92 passing through very thick Mediterranean forests which block out the usual sounds of towns and cities. 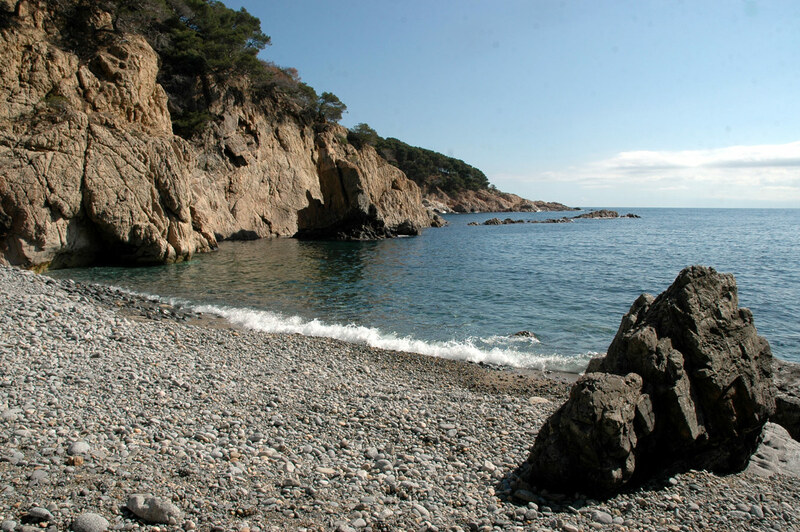 We will finally come to cala Pedrosa, a cove covered with pebbles with two clochans. Recommendations: this section is recommended for people used to the mountains. Follow the white and red markings of the GR-92, wear comfortable footwear and take water with you.